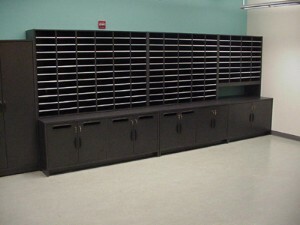 Satellite mail stations divide mail and document distribution across departments, floors or even separate campus locations. 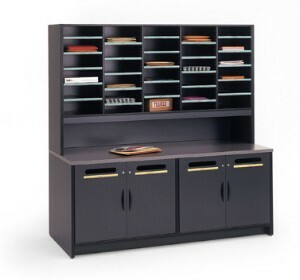 A wide variety of laminate selections and the ability to option-in custom accents provide a front office look to your interdepartmental and satellite mailing operations. Also can double as support stations for copy machines, network printers, fax machines as well as collating and preparation stations. Sort shelves readjust along full depth rigid PVC plastic channel guides that allow for easy shelf adjustment. Adjustable Plastic Shelving: Constructed of 1/8" thick .90 gauge polyethylene with memory retention. Shelves are adjustable on 1" increments that provide full depth support. Shelves are supported front and rear with aluminum index track and clear index cover and are rated for capacity loads up to 35 lbs. Adjustable Wood Shelving: Constructed of 5/8" thick matching thermally fused melamine with 1.5mm PVC edge banding. Shelves are adjustable on 1" increments and have optional self-applying index strips. Shelves are rated for capacity loads up to 50 lbs. Sort modules come in 1 to 6 column configurations. Modules up to 30" high feature 5 re-adjustable shelves providing 6 openings. Modules over 30" high feature 7 re-adjustable shelves providing 8 openings. Additional shelves can be purchased separately or in packs of five. Sort modules are available in standard closed back, open back for pass through operations and plexiglass back for additional working light. Sort modules available standard, legal or oversize configurations for standard 81/2 x 11 size documents, legal size documents and oversize documents like newspapers and periodicals. Side Panels: Constructed of 1" thick industrial grade 40-50 lb. substrate, double-faced melamine. Framed by matching 1.5mm PVC edge banding. Top and Bottom Panels: Constructed of 5/8" thick industrial grade 40-50 lb. substrate, double-faced melamine. Framed by matching 1.5mm PVC edge banding. Back Panel: Constructed of 5/8" thick industrial grade 40-50 lb. substrate, double-faced melamine. Vertical Dividers: Constructed of 5/8" thick industrial grade 40-50 lb. substrate, double-faced melamine. Framed by matching 1.5mm PVC edge banding. Sort modules are shipped fully assembled. Sort modules are assembled using Hafele mini-fix cam hidden fastener system with metal-to-metal connection points. Parts are drilled using a 32mm hole drilling via computer controlled point-to-point machines for insured uniformity and consistency. Sort module affixes to Hamilton Sorter consoles with Hafele mini-fix cam lock so that depth of sort module can be readjusted for varying user requirements. Plexiglass doors in clear or smoked plexiglass with available locking feature. Optional 3", 6", 12" or 18" risers for access to additional console worksurface. Optional display boards for locator lists. Shelf dividers for partitioning of polyethylene shelving. Module drawers for organizing worksurface items such as staplers, paper clips and other loose items.